She is bragging about working with SIOUX FALLS city councilors to get some pork for SE Tech (a place that is funded through our property taxes and sales taxes to the state), which has nothing to do with Tea and now that she works for the City of Sioux Falls, she will have to work with councilors, which brings us to why this is a conflict. 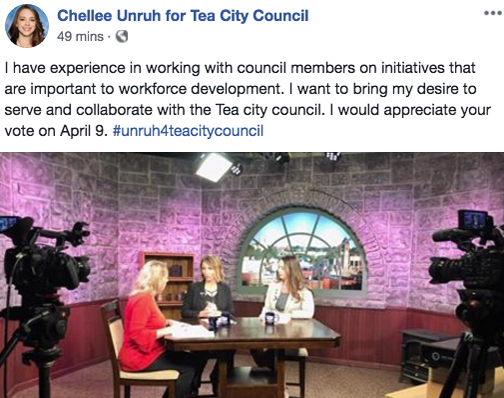 I’m not sure if any campaign rules were broken with this post, but I still would like to see an ethics question posed by the administration as to whether it is ethical for her to run for Tea City Council. I guess they are too busy trying to defend closed door meetings. A bill to close a “loophole” in South Dakota’s campaign finance laws is headed to Gov. Kristi Noem’s desk. 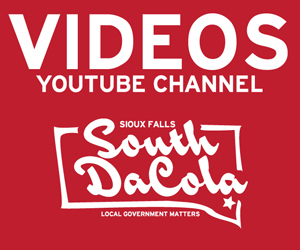 Sioux Falls’ last mayoral election caught the attention of state lawmakers when a local business owner wrote a series of checks on behalf of his school-age children as gifts to then-candidate Paul TenHaken. Docutap founder and owner Eric McDonald and his five children — ages 6 to 15 at the time — are each listed as contributors to TenHaken’s 2018 campaign, all six giving the maximum $1,000 donation. 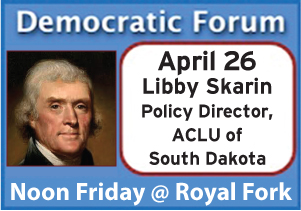 That spurred action by the South Dakota Legislature, which overwhelmingly approved legislation this week that will require donations to political candidates from minors go toward their parents’ giving limits. That means if a child gives, say, $100 to a candidate pursuing a municipal office, their parent would only be allowed to give $900 to the same campaign. For statewide races, the cap is $4,000. “It seemed like a giant loophole in our campaign finance law that could be very easily fixed,” said Sen. Reynold Nesiba (D-Sioux Falls), the prime sponsor of Senate Bill 114. Nesiba said he didn’t want to ban children under a certain age from participating in South Dakota elections as is the case in some other states. So he wrote SB 114 as a compromise. If signed by the governor, South Dakota will join 19 other states that prohibit or restrict minor donations, according to the National Conference of State Legislatures. TenHaken said the Nesiba and co-sponsor Rep. Kelly Sullivan (D-Sioux Falls) alerted him of their intentions with SB 114 prior to introducing it. A story I broke on DaCola. I always thought it was a little ‘sneaky’ to take donations from kids. I just joked the other day that maybe the reason PTH hosts kids in his home when their parents are having trouble is so he can ask for campaign donations. 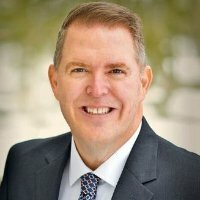 I’ve seen certain members of our city council die on some pretty stupid hills over the past decade, but defending a majority vote for city councilors in a probable runoff, a previous 20 year rule, that changed in a sneaky amendment move by a couple of outgoing councilors that had indigestion that day is pretty lame. 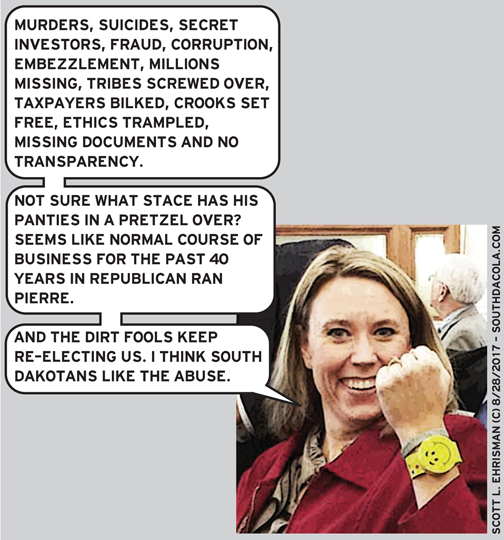 “You saw how we’re split on this issue and how it should be handled, so let’s let the people of Sioux Falls decide,” Starr told the Argus Leader Wednesday. Besides the fact that the rule worked for 20 years, most ‘intelligent’ people know that by pushing for runoffs in a council race you will eliminate grassroots candidates who won’t have the money, time or resources to run the full race. It will also cost the taxpayers more for an election that will only draw a ‘fake’ majority. This is really why councilors Erpenbach and Rolfing pushed for this, they don’t want ‘regular’ folks running for council, they only want those connected to the ‘club’. If you have ever noticed, the council candidates that are recruited by the elite in town (Soehl, Selberg, etc.) are usually shrews for big development and do little to improve the lives of the working class of our city. They contribute very little to us, and a lot to their campaign contributors. Grassroots candidates (who are lucky enough to win) represent the citizenry. Neither Soehl or Selberg say they’re eager to revisit the issue. 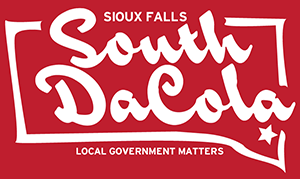 Soehl said he’s interested in what the public’s feelings are, but a special election could be seen as another attempt to tinker with election rules. Blah, Blah, Blah. The rule was in place for 20 years! The rule change hasn’t even been used yet. No harm, no foul. Change it back, most people wouldn’t even know it was changed for two years since it hasn’t even been used. I know Curt, you forgot to mention that in your statement. Selberg questions the need to hold a special election considering the council set the majority standard in 2017 and debated the matter once again just this month. “We still need to let this breathe a little bit before we’re out there trying to change it again,” he said. Breathe about what? A rule change that hasn’t even been used and was fine for 20 years without ONE SINGLE CITIZEN complaint! Just because Rolfing forgot his TUMS for a council meeting is no reason to change a 20 year rule that has worked well. I hate to use the words ‘Brain Dead’ but sometimes I wonder. Why die on this hill? Mayor TenHaken told the Argus that he hopes he doesn’t have to break a tie Tuesday night over changing back a 20 year old rule that served the citizens and city council just fine. I agree, he should not have to. While I can’t predict if it will pass or not, I do think it will come down on a 5-3 vote. And it should. It’s obvious that Stehly, Starr and Brekke support changing it back. While that is 3 votes, shouldn’t the other 2 they need be a piece of cake? Erickson and Neitzert voted against the change almost two years ago. Why? Because the process wasn’t broken. Now some have argued that this should be up to the voters. I suppose, and if you believe that, Brekke has offered that this be looked at by the Charter Revision Commission for the 2020 ballot. But as we all know, it wasn’t broken and should not have been changed to begin with. While Erickson and especially Neitzert have argued that they don’t want to be messing with city elections, this would be a perfect reason to change it back to as it was, unharmed for 20 years. In the last election, there was a city council run-0ff, but it still would have occurred under the old ordinance, because neither DeBoer or Soehl received the 34% plurality. Another reason why the change was not needed. 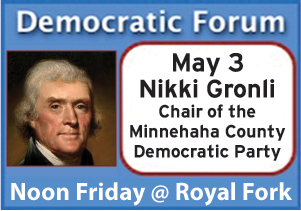 I don’t expect the votes of Rex Rolfing Jr. (Kiley) or Selberg (who probably doesn’t even understand the math) or Soehl (who sold his soul to Erpenbach and Huether a long time ago) to change. But I would expect Erickson and Neitzert to hold their votes like Starr, Stehly and Brekke did on the 2nd go around on the Elmwood street vacation. Cameraman Bruce has been crunching the latest numbers when it comes to ‘Likely’ voters in Sioux Falls. While we have much more data coming, some of the early results show of the approximately 17,000 consistent households that vote, only 3,000 are in Lincoln County. For all the talk of a “fast’ growing Lincoln County, the Sioux Falls resident voters still don’t like to vote in local elections. It also seems that $100K VOTE YES for Schools campaign was able to encourage a lot of first time voters or people who rarely vote. Seems like a busy 3 days, even for a savvy Gipper like Peters.